Vidwan Srirangam S Kannan was born on 5th May 1952 in Srirangam to K Sathyamurthy and Kamalam. His family was not one steeped in carnatic music. After completeing his graduation in mathematics, he joined Indian Bank which he served for 30 years before opting for retirement in 2000 as Manager. When he was 19 years old he happened to hear a concert in which Pudukkotai S Mahadevan played morsing. Fascinated by the magical sound of the instrument, he approached Mahadevan and after a bit of convincing joined as his disciple. 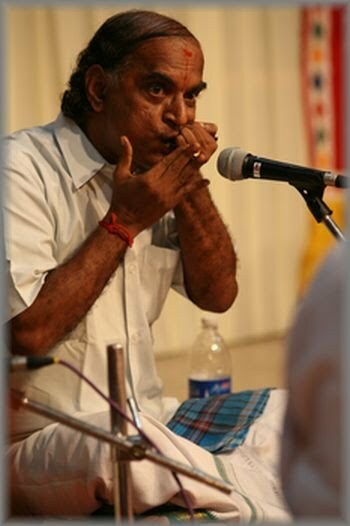 He also was initiated into the various aspects of laya by Kanadukathan Rajaraman, a kanjeera and mridangam artiste and a friend of Mahadevan. By age of 23 Srirangam S Kannan had started his career as a full-fledged Morsing artiste. Now, even after 35 years, he continues to enthrall his followers and fans with his amazing dexterity and adroitness in handling this instrument. It will not be an exaggeration to say that he has given new dimensions to the instrument. He is a TOP GRADE Artiste of the All India Radio (AIR).